Want to contribute to the Red Bike Project? Have an old bicycle laying around? Have a pile of old parts collecting dust and rust in the basement? Well you can clear out some space in the garage and help expand the Red Bike Project’s fleet of neat red painted bicycles by donating it! We are looking for bicycles and parts of all shapes and sizes in any condition. The Red Bike Project relies heavily on bicycle donations. Bikes are lost every year and your generous donations ensure a bright future for the Red Bike Project. 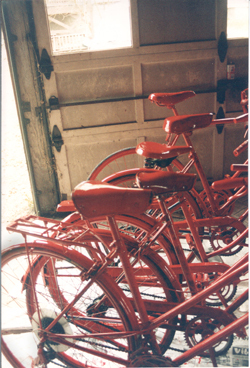 A Few Red Bike Project bicycles in a garage circa 1996. Thanks to everyone that has donated or volunteered or both!